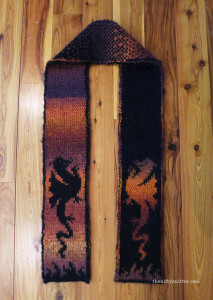 Fire Dragon Scarf is a double knit, reversible, thick scarf, featuring a dragon on both ends. 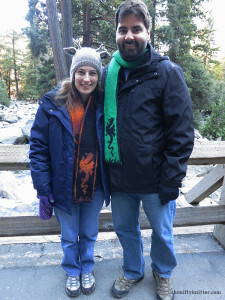 The pattern transitions colors halfway through the scarf so that each side is the inverse of the other. Finished length as written is 55 inches (140 cm), and can be lengthened following the written instructions. Contrasting yarns work best for this pattern since they will show off the design more easily. 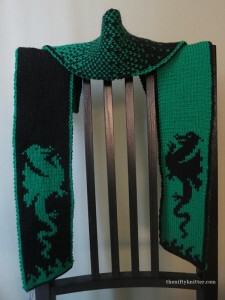 This pattern includes instructions for the double knitting technique. There are also tutorials here on ravelry and on youtube to learn how to double knit. 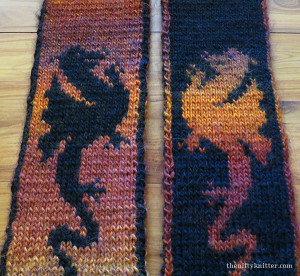 This is a suitable first double knitting project for the knitter wanting to try double knitting. Approximately 180-200 yards each of two contrasting colors of worsted weight yarn for a 55 inch (140 cm) length scarf. Length can be increased as directed using additional yarn.